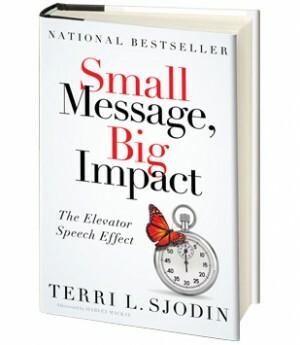 Terri L. Sjodin’s new work, Small Message, Big Impact: The Elevator Speech Effect, provides an entertaining, straightforward, and practical how-to guide on effectively communicating your critical message in a short period of time. She gives you an inspiring new perspective on the power of what she calls the Elevator Speech Effect and shows you how to employ this amazing little tool to create influence in today’s market. Perhaps you want to promote an idea, a project, or a concept. Maybe you are looking to create a more compelling message to sell a product or service that will help you access challenging decision makers. Whatever your purpose — be it professional, academic, political, philanthropic, or personal, you can learn to craft a fresh, brief, and persuasive message that generates tangible results. How to build a compelling and persuasive case using six of the most consistently effective arguments in today’s market. How to morph your elevator speech content and employ your best material in a variety of presentation opportunities, including the internet and social media platforms. How to speak in your own authentic voice-it’s not only what you say, it’s how you say it. This book includes outlines to help you craft your next talk, worksheets, a complete sample elevator speech, evaluation forms…and much more! The Small Message, Big Impact, CD Audio Program is available now for $29.98!